We’ve all been there. We invest in all kinds of activities for our kids to pursue. It’s part of the growing process: developing the whole person, not just academically, but physically, socially and emotionally. Then, as high school nears, that little voice sounds the alarm in the back of a parent’s head. Is my daughter or son good enough to make the team? Can they continue with music? Get a part in the play? Compete with other students? Is high school the end of the line? Not at Holy Family Catholic High School. Here, students get an opportunity to participate in the sports and many other activities they are most passionate about. Plus, they often discover a wide variety of other sports, academic teams, clubs and activities they never considered. With a student body of 400 kids, Holy Family provides unlimited opportunities to explore new things. Students often participate in more than one activity, not just during the school year, but also during a single season. “When looking at sports, there are students who were on the trap and lacrosse teams, or tennis, track and baseball,” Nick says. “But more common is a kid who participates in both a sport and one of our academic competitions. 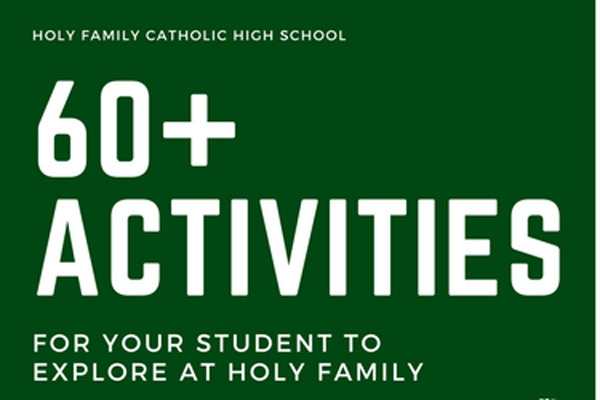 With over 60 extracurriculars to choose from, your Holy Family student is destined to pursue his or her talents, while trying new activities outside of the classroom. “There are a lot of people who chose Holy Family for the right reasons—faith-based environment, college prep, joining a community where their student is known and cared for,” Nick adds. “All of those things extend to our classroom, lunchroom and after-school activities. For students who enjoy the slopes, Holy Family offers students an opportunity to compete on an alpine ski team. This winter activity is offered as a co-op program with other school districts. Fire Baseball consistently fields one of the most competitive and highly ranked high school baseball programs in Minnesota. They won the 2012 2A state title at the newly opened Target Field. Coached by Matt Thuli, who won his 200th career coaching victory in 2016, Fire Boys Basketball is one of the top Catholic boys high school programs Minnesota has to offer. They won the Class 2A state championship in 2007 and earned Class 3A third place in 2014. In her first year as head coach of Fire Girls Basketball, Ellen Thompson and her assistant coaches brought the Fire to their first state tournament appearance in 2016. The program looks to remain strong with a great depth of talent and opportunity. Holy Family boys and girls cross-country teams are consistently two of the top performing and ranked high school cross-country teams in Minnesota high school athletics, with many runners competing after high school at Division I universities. Middle school students are invited to run with the FIRE through the Fall Middle School Cross Country and Conditioning Clinic. The Holy Family Fire dance team is a competitive athletic team, with opportunity for dancers to continue to grow their interest through high school. The team has earned numerous awards, including two state titles, five section championships and many Academic All-State honors. In the fall, dancers may also join dance club, which performs at halftime of home football games. Holy Family’s fencing team started in 2009 and has featured some of the top-ranked fencers in the country, with numerous state champions emerging from its ranks. Fencing is a club sport and competes against other high school teams in Minnesota, as well as against year-round fencing clubs not affiliated with high schools. Fire Football offers students interested in the game an opportunity to be a part of a successful Minnesota high school football program that has made several state appearances, most recently finishing as Division 2A runner-up in 2013. Beginning with freshman year, athletes with varying levels, knowledge and abilities in the sport gain valuable game experience before moving to the varsity program for their sophomore through senior years. Fire Boys Golf offers students with varying levels of skill and knowledge of golf a chance to develop skills that last a lifetime. Fire Boys Golf program, coming off its state championship runner-up finish in 2017, competes in Class AA against some of the best high school golf programs in Minnesota. Fire Girls Golf offers students, with varying levels of skills, competition on the course. They develop solid fundamentals in the sport that stay with them long beyond high school. Each year the program has consistently sent individual competitors to the state tournament. Holy Family Boys Hockey program has developed into one of the premier high school hockey programs in Minnesota. Holy Family hockey team is part of the very competitive Wright County Conference and Section 6AA, and has been consistently ranked among the top state teams. 2018-2019 marks the inaugural season for the Fire Girls Hockey Program. Previous to this year, the team competed as a co-op program which was a repeat conference champ. The team competes in the Wright County Conference and Section 2A. Head coach Randy Koepll is excited to welcome back a strong core of talent and to build a premier girls high school hockey program in Minnesota. The Boys Lacrosse team is in its eighth year at Holy Family Catholic High School. Founded by a group of dedicated students in 2008 as a club sport, the team moved into a MSHSL sanctioned sport the following year and continues to develop into a recognized force within high school lacrosse programs in Minnesota. Fire Girls Lacrosse consistently ranks as one of the top-10 girls high school lacrosse programs in Minnesota, fielding several athletes that have gone on to play in the college ranks. Fire Girls Lacrosse plays an independent season schedule and competes in the very tough Section 2 in MSHSL’s single class girls’ lacrosse structure. Head coach Nathan Kennedy encourages inexperienced and experienced skiers to join the Nordic ski team. His goals for the program are, first, to teach an incredibly fun and challenging sport to as many students as possible, creating a fun and rewarding experience for all athletes. The second objective is to coach skiers to be their best. Holy Family boasts one of the most competitive high school boys soccer programs Minnesota offers. The team is coached by Jorge Oconitrillo and assistant coaches Case Unverzagt, Brian Aubrey and Nathan Kennedy. Many young athletes return to this sport of their youth and find opportunities to play on one of the three teams: varsity, JV green and JV white. Holy Family has continuously fielded a strong Girls Soccer team, with numerous players receiving all-conference, all-section and All-State awards. Several players have gone on to play in Division I college programs, such as the University of Northern Illinois and Bucknell University near Philadelphia. Fire Softball offers girls with varying levels of experience the opportunity to play in a competitive softball high school program. Offered as a co-op program with other school districts, Holy Family offers the opportunity for students to compete on a boys swimming and diving team. Swimmers from Holy Family participate in the Mound Westonka-Holy Family co-op. Coached by Ben Hanson, swim practices are held at the Mound Westonka High School pool every day after school. Each year the team sends multiple athletes to participate in the state meet, where they compete against the top high school girls swim programs in Minnesota. Following graduation, multiple swimmers have continued on with Division 1 swim teams. The Fire Boys Tennis program offers an opportunity for athletes of all skill levels to improve their tennis game and experience competition, teamwork and pride, while developing character and sportsmanship. It strives to provide an atmosphere for individual and team growth, while supporting academic excellence. Fire Girls Tennis earned three straight trips to the MSHSL State Tournament in the past three years. They are the 2014 State Class AA State Team Champions, 2016 Class AA State Team Consolation Champions and 2018 Class AA State Second Place Team. Tennis players with varying levels of skills find opportunities to play in the program. Fire Track and Field is a terrific opportunity for athletes with all levels of experience to participate and develop their skills, while enjoying a competitive team environment and individual success. Many fall and winter sports athletes discover the benefits of cross training in events that build strength, endurance and agility, with several athletes advancing to the state meet each year. The Fire Trap Team participates in the fall league of the Minnesota State High School Clay Target League and the spring league, which culminates in the Minnesota State High School Clay Target League State Trap Shooting Championships. Holy Family was one of the earliest schools to join the state league and field a team. In 2015, the Fire Trap Team took sixth place in the state tournament. In 2015 alone, there were 425 schools competing on 268 high school trap teams in Minnesota and since has grown to include 16,600 student-athletes representing 615 high schools. Holy Family Catholic High School’s volleyball program is committed to helping each player strive each day to be the best person and the best athlete she can be. Players will use volleyball as an avenue to learn teamwork, commitment, integrity, accountability and respect. Offered as a co-op program with other school districts, Holy Family students can advance their skills in the sport of wrestling at the competitive high school level. We are excited to announce the launch of Holy Family Catholic High School’s newest pilot program– Business andMarketing Club. This club enagages students in real-world problem solving and gain authentic experience in business development, marketing, communications, and finance. Holy Family’s Knowledge Bowl team, coached by Holy Family science instructor Jim Walker, practices for approximately one hour on Tuesdays and Thursdays year-round. During the season they compete against local schools and frequently place among the top teams. The team placed as high as 4th in state and has qualified for postseason competition every year from 2006 to 2016. Fall season offers team members to compete as a member of a Quiz Bowl team which competes as part of the NAQT program. Math League is a competitive academic league competing in the Minnesota State High School Mathematics League with other math league teams in Minnesota. Students compete in a variety of high school level math topics, with several students earning top awards. In 2017, the varsity team placed second at the state tournament. The Minnesota State Bar Association’s High School Mock Trial Program is an exciting law-related education program that introduces students to the American legal system and provides a challenging opportunity for personal growth and achievement. Students interested in law as a career find this competitive program an insightful and exciting introduction to courtroom dynamics. Model Assembly is an incredibly realistic and complex simulation of Minnesota state government. Approximately 1,600 Minnesota high-school students, in grades 8-12, take part in the Model Assembly Session every January. It is part of the Holy Family Youth in Government (YIG) program, which also includes Model UN. A simulation in which students, representing UN member states, meet to find solutions to common problems. It offers a world of opportunity where concepts and principles from the classroom come to life. It is part of the Holy Family Youth in Government (YIG) program, which also includes Model Assembly. From foundational learning to the practical application of skills, students apply their knowledge and skills in programming, robotics and engineering to contribute as team members in the school’s robotics club, Pyrobotics. Pyrobotics competes with one to two teams in two divisions, FTC and FRC, against high-school robotics programs in Minnesota at qualification events. FTC is a class and meets every day in the fall and will compete in late November. The FRC team is a club, which meets from January through April. In 2017, the team won the 10,000 Lakes Regional Competition, which earned them a second trip to the world competition in St. Louis. Minnesota YMCA Youth in Government (YIG) is a youth development program emphasizing the Y’s four core values of caring, honesty, respect and responsibility. This program includes Model UN and Model Assembly, giving students opportunities to grow leadership skills through these multi-school competitions and activities. Holy Family’s Theater program provides opportunities for every student involved to participate as an actor, a stage or sound technician, or both! We produce a variety of productions each year in a state of the art Performance Art Center opened in 2015. The program offers a dynamic, creative environment where students learn to take risks and communicate with honesty, clarity and passion. The theatre department presents a musical and one-act play each year. Musicians will find a state-of-the-art band room with acoustic panels and instrument lockers just outside the classroom. Instrumentalists perform at three music concerts each year and have additional opportunities through jazz night, coffeehouse performance and, for the pep band, athletic events. The Jazz Band is selected by audition only and is both curricular and extracurricular. The Jazz Ensemble will perform a wide range of jazz styles including swing, funk, Latin and ballad. The String Ensemble performs classic and popular repertoire for strings. The group includes all four members of the string family: violin, viola, cello, and bass. Performs drumming and percussion music from the traditions of Africa and Latin America. Holy Family’s vocal music program has a long tradition of excellence and opportunity. The choirs and ensembles perform at three concerts each year: fall, Christmas and spring. There are a number of high-level performance groups that allow students to advance their vocal gifts including: Voices of Fire, Pop Culture, Vocal Ensemble and the all-female Camerata Chorus. Voices of Fire is a 10-person, audition-only, vocal jazz group made up of sophomores, juniors and seniors. Sometimes instrumentalists join the group, adding piano, drums and bass guitar. This group provides music for all of the All School Masses. The type of vocal ensemble varies from a men’s barbershop quartet or female acapella depending on the mix of voices in the choir and interest in performing. Pop Culture is a 10-person, by audition, mixed-voice pop group with singers coming from any grade level. Auditions are held the first week of school and all students are encouraged to try out. Visual Arts are integral to the intellectual, emotional and physical growth of students. Visual arts provide an opportunity for students to be expressive in different media and develop higher order thinking skills. Students enrolled or interested in the visual arts display their pieces during these annual art shows. These shows feature student work in ceramics, drawings, paintings, photography, video and animation. Art Club is open to all students who enjoy creating, viewing or socializing in connection to art. Art Club also contributes bowls to the PROP Food Shelf Empty Bowls fund-raiser. Currently formed as a mens bible study club, students with a shared interest in deepening their knowledge and understanding of the Bible meet monthly after school with a theology teacher/advisor to read and delve into the scriptures. Students with a shared interest in books and reading get together about once a month to discuss favorite books and to decide on which book to read before the next meeting. The Bowling Club had its inaugural year in 2017. It is designed to be a social activity for the 6 weeks between the ending of many winter sports and the start of spring sports. It is held once a week after school at the Country Side Lanes in Shorewood. The mission of Holy Campus Ministry is to assist the Holy Family community in the growth of a flourishing spiritual life. We recognize that God has given each of us unique gifts to respond to His call, through the power of the Holy Spirit, to build His Kingdom of a living Christian Faith Community. Fall Dance Club allows its members to experience friendship, the wonder of dance and the joy of performing. Dance club season runs from August through October, ending just in time for the winter competition team tryouts. The Eco-Freako Club educates and organizes activities to create an environmentally friendly school environment. Activities include recycling, composting programs and awareness activities. The 25- to 30-member Fire for Life Club promotes the Catholic Social Teaching theme of the dignity of the human person in regards to all life issues from conception to natural death. This club travels to Washington, D.C. to participate in the March for Life annually. Holy Family Catholic High School Competitive Fishing Club is open to all students with some bass fishing experience. The club competes in spring and summer bass fishing team. Members may join the club the summer after grade 8. Holy Family’s health club promotes healthy lifestyle decisions and educates the student body on issues facing teens in the world today. The Holy Family Italian Club is a student-run organization promoting Italian culture. All students are welcomed and encouraged to join regardless of language studied. As students at a Lasallian school, all Holy Family students are members of the Lasallian Youth organization. Students are encouraged to attend meetings to help promote the Lasallian ideals of St. John Baptist de Lasalle. The Holy Family Marketing Club will be a pilot program for the 2017-18 school year moving into a DECA Chapter for the 2018-19 school year. Students interested in marketing, sales and business leadership will find growth opportunities within this nationally recognized program. This club is passionate about philosophy and interested in learning more about famous philosophers. The purpose of the Spanish Club is to promote an interest in Spanish language and culture among students. The club is open to students who want to learn about Spanish culture while practicing their use of the Spanish language. Student council is an organization that plans and executes various all-school events such as prom, homecoming week, giant recess and the Holy Family blood drive. The Phoenix is an online newspaper written and created by students, for students at Holy Family Catholic High School. The newspaper covers a wide variety of school events and presents a student view on current events in the broader community. The creation of the HF Yearbook takes place in the Publication Design course. Creating yearbook pages requires and develops skills in photography, writing, editing, visual design, and project management.